As someone who wants video game movies to succeed, I wanted the initial negative reviews of “Warcraft” to be a simple case of misunderstanding. It’s high fantasy and it’s based on a long running game franchise that has had years to expand its lore. Throwing all of it into an hour and forty minute film couldn’t have been easy, especially if the writers wanted to avoid long boring expository scenes. There was bound to be something lost in translation here, I told myself. But there's sadly a lot of truth to the negative reviews. This film is so messy it threatened to leave even a fan of high fantasy like myself in the dust at every turn. Writers Duncan Jones, Charles Leavitt, and Chris Metzen took an approach that involved such minimal exposition and lore establishing that it’s borderline completely unapproachable. Despite being a fan of high fantasy and video games, I haven’t played the “Warcraft” games. As such, I needed more explanation than this film was willing to supply. I forgave its rough scene transitions patiently waiting for it to come together, but it never did. It only got lost within itself veering further and further off the rails the longer it went on. Yet it isn’t just explanation of the two worlds colliding, or the magic portals that allow transportation between them, or even the dark (green) magic versus light (blue) magic that felt in short supply. Just about every character feels like a generic archetype with very little time dedicated to fleshing them out. 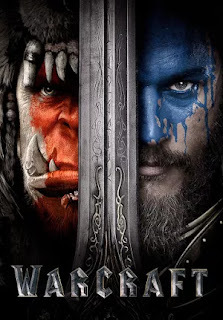 It’s as if this film were meant to be a prequel to a series of “Warcraft” films that already exist. Except they don’t exist, and we have no previous ties to or understanding of who these people are. Being based on the games doesn’t free it from needing to establish its characters. We follow Durotan (Toby Kebbell) an orc forced to flee his dying home world along with the rest of his people. Their leader Gul'dan (Daniel Wu) uses his dark magic, known as the fel, to open a portal to Azeroth. This dark magic is powered by the life force of the living. Even after rounding up as many prisoners as they can, they only have enough life force to open the portal long enough for half of their Horde to make it through. Once they do pass through to Azeroth they set to work killing and capturing humans to power their portal for the other half. However, Durotan begins to distrust Gul’dan after noticing the way his dark magic seems to kill all life and vegetation no matter where it goes. Meanwhile on the human side of things we follow the warrior Lothar (Travis Fimmel), the mage Khadgar (Ben Schnetzer), the King Llane Wrynn (Dominic Cooper), and the guardian Medivh (Ben Foster). That’s a lot of characters to juggle, and there are sons and wives or love interests for some of them as well. If it didn’t have its hands full juggling what’s going on with all of the human characters, intermittent scene changes to check back in with Durotan and the Horde derail any narrative momentum the human side of things might have been gaining. Things begin to just happen for no rhyme or reason. And because we don’t know these characters very well we don’t understand the motivations for any of their actions. Some characters begin good, turn evil, then become good again and sometimes all within the same scene. Why some of the characters do what they do, or how and why they're connected to certain other characters is never explained and never makes sense. What it does well is look like a video game movie. The special effects are outstanding. The CGI creatures and locations all look very well made and remain mostly true to what I’ve seen of the games. The action is brutal and exactly the sort of battle scenes you’d want to see in a fantasy film with “war” in the title. Yet the biggest shortcoming of the look of the film is a problem with the casting. Travis Fimmel works as the human warrior, but I remain wholly unconvinced that in any world Ruth Negga could be his biological sister. And Dominic Cooper, Ben Schnetzer and Ben Foster - who is by far the worst offender here - look far too contemporary to be in this high fantasy medieval setting. It also takes itself so seriously that there’s very little fun to be had. Though it’s possible all the moments of levity ended up on the cutting room floor. Duncan Jones was forced to cut at least twenty minutes out of this film and it shows in a bad way. I’m not sure it would have fixed all of the issues, but it certainly didn’t help. These cuts likely caused the aforementioned rough transitions, making places where things were “tightened up” feel very obvious. Too many times the film awkwardly cut back and forth when scenes felt half over. Combine that with the information that seemed to be missing, and you’ve got a sloppy mess on your hands. I wanted to like this movie because I want video game movies to succeed. I want them to get better, and I want more studios to take a chance on them. There are still game franchises I’d like to see hit the big screen. As for “Warcraft,” it’s a little like being invited to a friend’s work party. I don’t know anyone there, and I feel like I’m missing out on all the inside jokes they’re telling.